From the Department of Neurology (N.N.M., J.A.T., W.J.L., M.M. ), Department of Laboratory Medicine and Pathology (Z.N. ), Department of Clinical Genomics (Z.N. ), and Department of Biochemistry & Molecular Biology (C.C., K.L. ), Mayo Clinic, Rochester, MN. 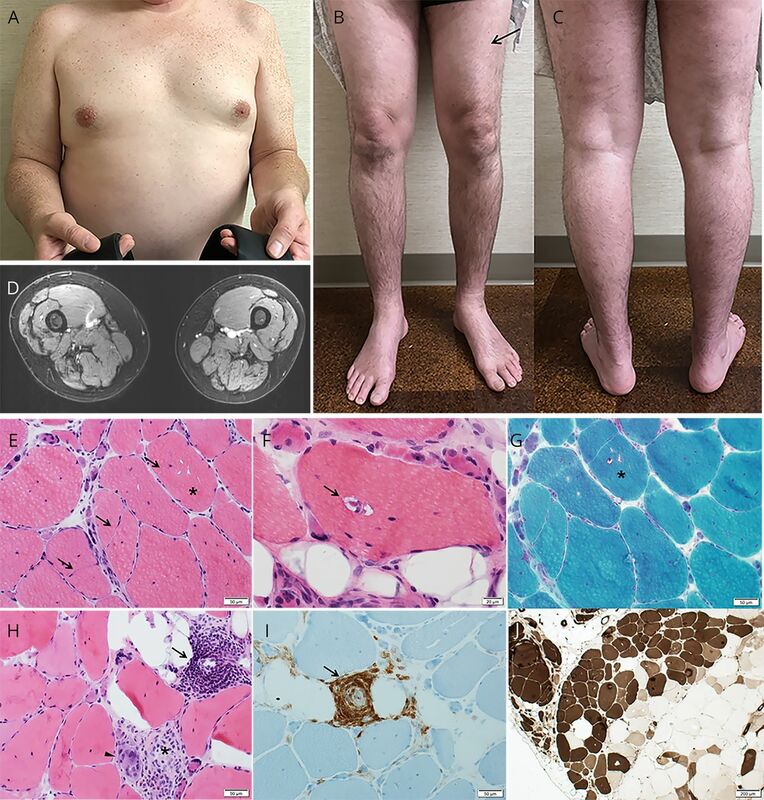 A 44-year-old Caucasian man presented with a 7-year history of upper and lower limb muscle fasciculations and cramps, progressive asymmetric weakness, muscle atrophy, and length-dependent sensory loss. His parents (deceased), 3 older siblings, and 3 children had no history of neurologic symptoms, including weakness and sensory symptoms, with the exception of cramps in the mother. He was not taking any medication known to cause neuropathy or myopathy. On examination, there was right greater than left shoulder girdle muscle weakness and atrophy (Medical Research Council grades 3/5 and 4/5), intrinsic left hand muscle weakness (4+/5) with atrophy, asymmetric pelvic girdle (4/5 right, 3/5 left), and left foot dorsiflexor weakness (4+/5). Strength of neck flexor and extensors, and axial muscles, was normal. He had bilateral calf muscle atrophy and weakness as suggested by his inability to stand on toes (figure, A–C). He was areflexic. Sensory examination revealed distal vibration and pinprick deficits in the upper and lower limbs in a length-dependent fashion. He had bilateral pes cavus. Patient photographs depicting pectoralis and biceps brachii atrophy (A), asymmetric quadriceps atrophy (B, arrow), anterior lower limb (B), and calf muscle atrophy (C). Muscle MRI (D) showing diffuse thigh muscle atrophy, greatest in the hamstring (open triangles) and vastus lateralis (solid triangles) muscles, bilaterally. Quadriceps muscle biopsy showing (E, F, and H, hematoxylin-eosin) muscle fiber size variability ranging from 15 to 160 μm, groups of atrophic fibers, fiber splitting and internalized nuclei (E, arrows), few fibers with multiple small non-rimmed vacuoles (E, asterisks, representative fiber), and increased perimysial fibrous and fatty connective tissue; rimmed vacuoles (F, arrow, representative fiber), which were also observed in modified Gomori trichrome staining (G, asterisk, fiber with rimmed vacuoles). Congo red-stained sections viewed under rhodamine optics revealed no congophilic deposits (data not shown). Regenerating (H, arrow head) and necrotic (H, asterisk) fibers and foci of perivascular inflammatory reactions (H, arrow) were seen in some regions of the sections (hematoxylin-eosin). Immunocytochemical studies characterized the perivascular inflammatory cells as CD45+ (I); invasion of non-necrotic muscle fibers by inflammatory cells was not observed. ATPase reacted section (pH 4.6) showed extensive grouping of the type 1 and type 2A fibers in several fascicles (J), where the darkest fibers are type 1 and lightest fibers are type 2A, suggestive of reinnervation; the atrophic fibers were of either histochemical type. Serial measurements of serum creatine kinase ranged between 840 and 2,400 U/L (normal <336 U/L) over the preceding 4 years. MRI revealed thigh muscle atrophy (figure, D). Neurophysiologic studies demonstrated reduced motor conduction amplitudes and diffuse fibrillation and fasciculation potentials with large motor unit potentials suggestive of a motor neuronopathy. No small motor unit potentials were recorded. Sensory nerve action potentials were absent in the upper and lower limbs. A muscle biopsy of the quadriceps, performed a year prior to presentation in our clinic, showed mixed neurogenic and myopathic changes with several fibers containing rimmed and non-rimmed vacuoles, and perivascular inflammation (figure, E–J). Targeted next generation exome sequencing (NGS) of 95 genes associated with hereditary neuropathy and motor neuron disease detected a known pathogenic heterozygous missense variant in exon 8 (c.854C>T, p.Pro285Leu) of the tropomyosin-receptor kinase-fused gene (TFG), located within a carboxy-terminal proline-glutamine (P/Q)-rich domain. NGS of 104 genes associated with myopathies (appendix e-1, links.lww.com/NXG/A118), including myopathies with rimmed vacuoles, revealed no pathogenic variants. Living relatives declined genetic testing. Low-complexity protein domains enriched for glutamine repeats, with proline (P/Q) and asparagine (N/Q), are also found in prions and are implicated in several degenerative neuromuscular disease models of DNA, RNA, and protein processing that result in cytoplasmic inclusions and templated protein propagation.7 The p.Glu384Lys mutation in TIA1 cytotoxic granule-associated RNA binding protein, for example, occurs directly within a glutamine-rich prion-related domain and causes distal myopathy with rimmed vacuoles, while an adjacent mutation (pPro362Leu) in the same low complexity domain has been reported in a kindred with ALS. Mutations in prion-like domains in hnRNPA2B1 and hnRNPA1 associate with vacuolar myopathy and motor neuron disease. Mutations in matrin-3, another RNA binding protein involved in stress granule formation, also lead to myopathy with rimmed vacuoles and ALS. TFG therefore extends the list of genes associating with vacuolar myopathy, motor neuron disease, and neuropathy. This work was supported by a generous gift from a Mayo Clinic benefactor to M. Milone and Z. Niu. N.N. Madigan is an employee of the Mayo Clinic (neurology fellow). J.A. Tracy reports no disclosures. W.J. Litchy has received research funding from Ionis Pharmaceuticals and Alnylam (compensation for travel and training investigators). C. Chen reports no disclosures. K. Ling holds a patent for Phosphatidylinositol phosphate kinase type Igamma regulates focal adhesions and cell migration. M. Milone has received research funding from a Mayo Clinic benefactor, and through discretionary funding from the Department of Neurology. Full disclosure form information provided by the authors is available with the full text of this article at Neurology.org/NG. The authors thank the patient for the photographs; Dr. A. Kendler at University of Cincinnati for sharing the muscle biopsy slides; and Invitae for performing the additional analysis of genes associated with myopathies.
. The TRK-fused gene is mutated in hereditary motor and sensory neuropathy with proximal dominant involvement. Am J Hum Genet 2012;91:320–329.
. Brainstem and spinal cord motor neuron involvement with optineurin inclusions in proximal-dominant hereditary motor and sensory neuropathy. J Neurol Neurosurg Psychiatry 2011;82:1402–1403.
. A novel TFG mutation causes Charcot-Marie-Tooth disease type 2 and impairs TFG function. Neurology 2014;83:903–912.
. TFG-related neurologic disorders: new insights into relationships between endoplasmic reticulum and neurodegeneration. J Neuropathol Exp Neurol 2016;75:299–305.
. Homoygouse mutation in HSPB1 causing distal vacuolar myopathy and motor neuropathy. Neurol Genet 2017;3:e168.
. Clinical spectrum of valosin containing protein (VCP)-opathy. Muscle Nerve 2016;54:94–99.
. The evolutionary scope and neurological disease linkage of yeast-prion-like proteins in humans. Biol Direct 2016;11:32. Author reply to Pinto et al.